Whoever said “you can’t have it all,” clearly had never been faced with one of life’s more privileged quandaries: sedan, or coupe, and discovered the penultimate answer: the Mercedes Benz CLS. This, the original “4Door coupe,” predated the BMW variant by some 6 years, and VW’s Passat CC look-alike by 2 years. It would appear that the sincerest form of flattery is indeed imitation, at least in the realm of German auto manufacturers. So what is a 4 door coupe, anyhow? A sedan with less headroom, or a nimble driver’s car that just happens to have somewhat easier access to the rear seats? In the case of the CLS, a bit of both. A compromise that isn’t necessarily a zero sum game, the CLS provides additional space all the while delivering a driving experience that’s less sedan-like, and more grand tourer. Not a bad match, in our opinion. Powering the Mercedes is a grunting 5.5L V8 producing 382HP and a very accessible 391 ft-lbs or torque at a scant 2800rpm, mated to a 7 speed automatic transmission that shifts effortlessly. This car oozes smooth, but not at the expense of driver engagement. The car belies its size and formidable weight of some 4020 lbs. Creature comforts abound, with 10 way power adjustable front seats, premium leather, heated seats, cruise control, navigation and premium sound, to name a few. Passengers are treated to comfortable, yet firm seats that seem to affirm that this is indeed a driver’s car. Outward visibility is surprisingly better than one might expect; the Mercedes’ sloped roofline doesn’t seem to hamper safe lane changes, nor does it amplify blindspots. 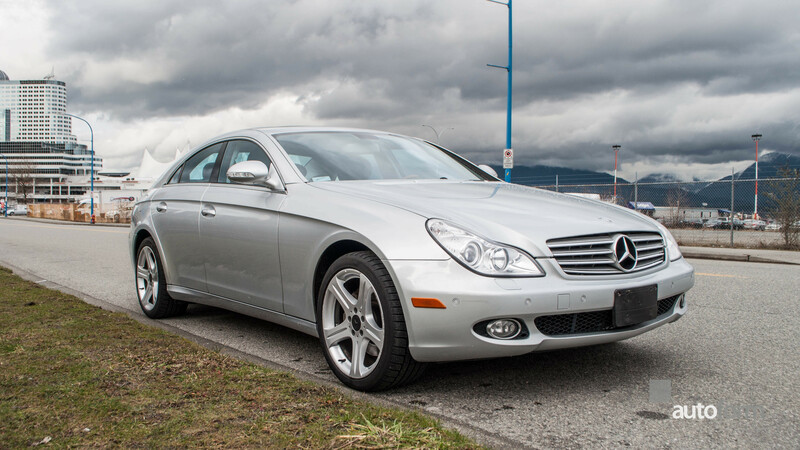 All this in a package that is less than the cost of a current Honda Civic, this low mileage Mercedes is sure to deliver safety and performance specs beyond anything a Civic could hope to, combined with striking good looks, and a pedigree that only a Mercedes Benz can deliver. Stellar value.